What is it about a scone anyway that seems to take you away to foreign places? Maybe it’s the hot pot of tea you made to go along with it or maybe its the Devonshire cream and the strawberry jam (fresh made even better) that you are going to slather on the scone that takes you to that place. 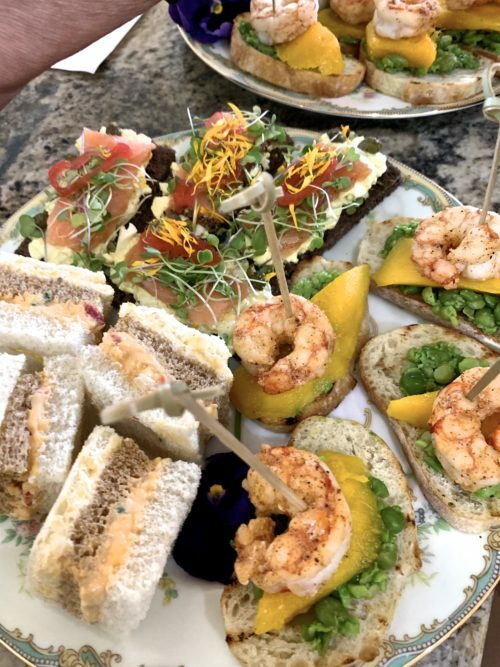 When I’m having a pot of tea I usually think of tea at the Fairmont in Victoria, afternoon tea once in Jamaica at our resort, tea at the St. Regis in Houston or even my own house with some nice scones coming right out of the oven. Thanks to BJ Brewhouse for this recipe. 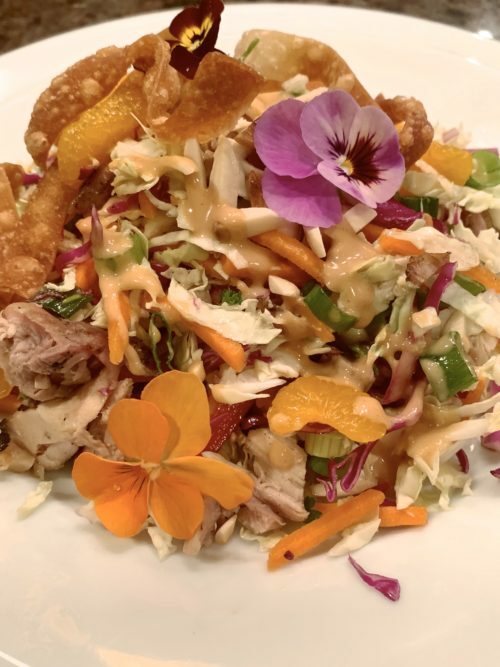 I don’t know about you but I expect certain things in an Asian Salad; cabbage (red and savoy or Napa), Mandarin oranges, almonds, green onions just to name a few. BJ Brewhouse use to have to best Asian salad but for some reason they changed their cabbages to lettuce and that does not work in an Asian salad for me so I no longer order it. Recently I ordered an Asian salad from Pei Wei (owned by Pf Changs). Not good and I told them about it (not in person of course; I do not have that much nerve). Their salad was made of lettuce, and tomatoes. I’ve never had an Asian salad with tomatoes and it didn’t even have an Asian salad tase. It was more like a “house” salad that they threw in some fried wonton strips and called it a day. No longer will we be going to that restaurant either. I’m really not that picky I don’t think. What would afternoon tea be without a cocktail. Our afternoon tea a couple week ago started with this blackberry thyme champagne cocktail and of course our committee had to sample it before the tea to make sure it was just right. Some of the ladies helping decided they liked it a little sweeter so we added more than the one teaspoon of blackberry syrup the recipe. One teaspoon of the syrup will give you a nice glass of pinkish champagne or prosecco. 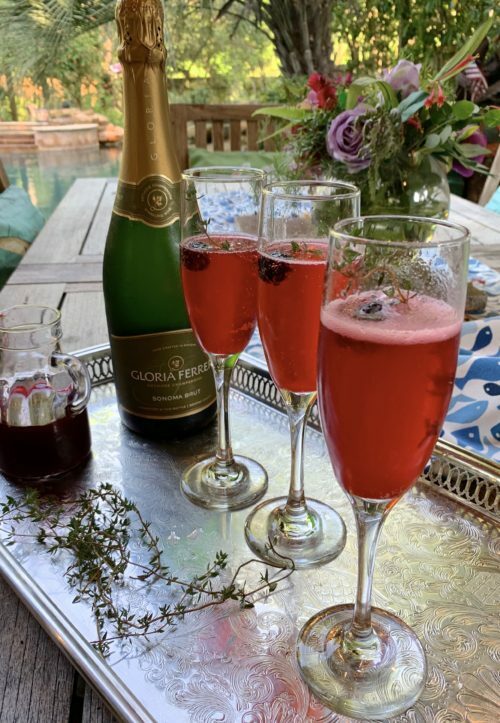 Don’t you just love the bubbles of champagne and when you add this blackberry syrup to the glass it makes for a perfect cocktail and the sprig of fresh thyme and a blackberry for garnish. At the tea we served this cocktail with some blue cheese stuffed dates wrapped with prosciutto before the ladies sat down to an afternoon of tea with sandwiches, sweets and scones. 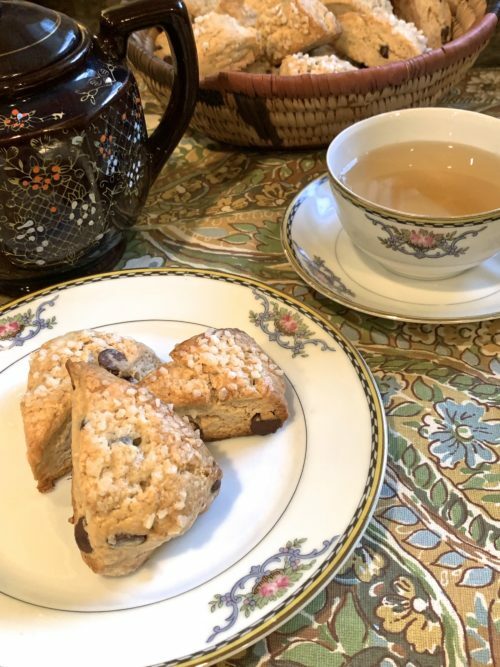 Over the years I have experimented with so many different recipes for scones; Black Walnut, Almond Coconut, Chocolate Cherry, Pumpkin Chocolate and one of my favorite has been my Walnut Lavender Scones. 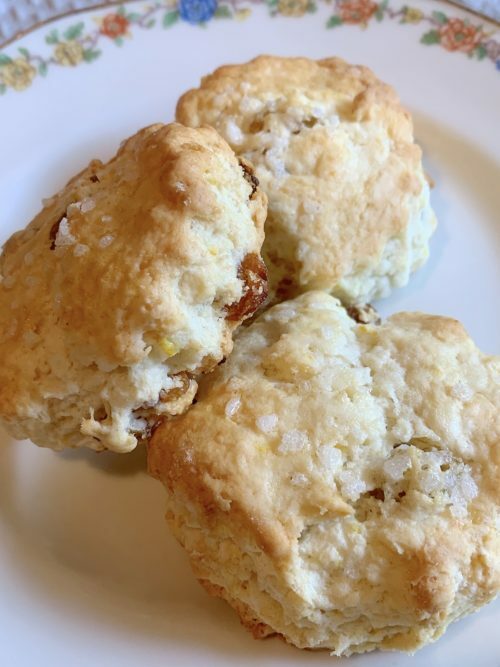 I’m sure I’ve made orange scones before maybe with raisins but for this one I decided to use golden raisins and then brush the tops with cream and add some of my hail sugar. Apricot and Pimento Cheese, Yum! My craft circle auctioned off another tea this past November and it was so much fun putting together the menu for 20 ladies to enjoy. I love tea foods; savories, sweets, the scones, the jam and clotted cream and of course the different kinds of teas I like to try. For this tea we served Georgian Village and Versailles Blend. One of my favorites is a Green Walnut tea and an Almond Cookie tea both of which I buy from the Tea Embassy in Austin (online). We gave those teas as part of their favors they picked up on their way home. I like to add in a little Amuse Bouche for an opener. In case you didn’t know an Amuse Bouche is a little bite that is meant to show the chef’s style. A little mouth amuser. I first had one in NYC and before that I had never heard the term. This made the perfect little bite to go with the Blackberry Thyme Champagne Cocktail we served.